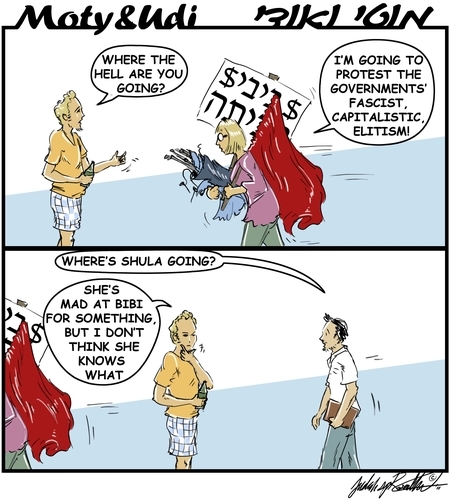 This week’s cartoon is about the affordable housing protests that are currently taking place in Tel Aviv. There is no doubt that a young couple simply cannot afford to buy or even rent an apartment in many parts of Israel. There are a lot of reasons for this — simple supply and demand, the lack of a stable rental market (most rentals are temporary, the owner of the property being abroad or waiting for his children to get married, etc.) — but it is a fact. “My Israel” (Hebrew site here) is an umbrella organization that specializes in the use of social media to spread the message of its member groups. Although Israelis would call it ‘right-wing’, that’s misleading to English-speakers — ‘Zionist’, ‘pro-IDF’ and ‘pro-settlement’ would be more accurate. My Israel offered on Friday to join the protest, on condition that the national anthem would be sung. However, on Saturday night, it announced that housing protest leader “Daphni Leef’s people evaded and evaded” committing to singing Hatikva at the event in Tel Aviv. On Friday, Ma’ariv columnist Kalman Liebskind listed various leaders of the housing protest and their associations with left-wing organizations and parties, such as Leef, a film editor for the New Israel Fund, Yehudit Ilani of the Balad Party, and Alon Lee Green of the Hadash Party. PM Netanyahu is putting forward a plan to improve the housing market and reduce the cost of living in general. All this goes to show that Israel can be a normal country with normal problems when the pressure of the security situation is relaxed, if only temporarily. This entry was posted on Monday, August 1st, 2011 at 4:01 pm and is filed under Moty & Udi. You can follow any responses to this entry through the RSS 2.0 feed. Both comments and pings are currently closed. I had been keeping my head in the sand about this one. Why? Because a large share of the complaints of the protestors are justified. There is tremendous concentration , price- fixing in the Israeli economy. The price of apartments has gone so high as to crowd young Israelis out of the market. There is a tremendous amount of bureaucratic inefficiency, and probably corruption involved with the whole real estate situation. There are very real complaints. But your pointing out that the heads or some of the major figures in the protest are from the anti- Israel crowd casts a shadow over the whole protest enterprise. Again then ‘the center’ is not really represented but rather preempted by the Extreme Left. Chaval. I don’t live there. But Caroline Glick does, and she makes a convincing case in her most recent column that the protesters are utterly ignorant of the underlying economic issues. The timing of these protests is very interesting to me. Right before some, ah, important events coming up next month at the UN. What a great time to undermine public support/confidence in the national leadership!